Creamy. Dreamy. Peachy. Yup, all of those are checked off. 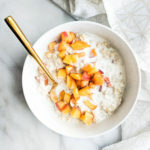 These Peaches and Cream Overnight Oats are refined sugar free and the creamiest oatmeal you will ever eat! Overnight Oats are probably one of the best “inventions” of the 21st century. 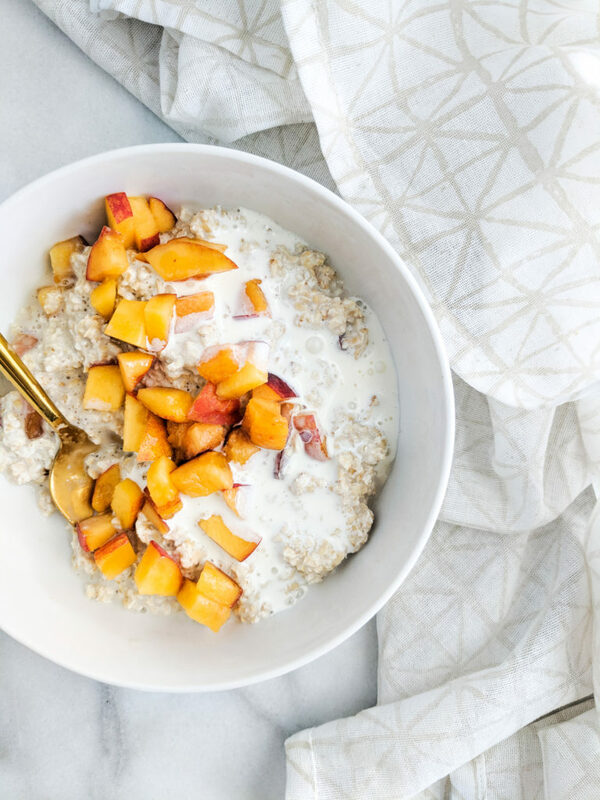 I mean, on those nights when I stay up until midnight in a rabbit hole watching cute puppy videos on Youtube – you best believe I’m not feeling like waking up at 6 AM to put together my cute oatmeal bowl to post on Insta. So why not create a delicious recipe that I can make the night before? That way, when I wake up from my puppy dream slumber, I’m able to go immediately to my coffee. (Yes, coffee first. Always. Amen.) and then to my breakfast that’s conveniently waiting in the fridge for me! Sounds great to me! I’ve made a couple different overnight oats recipes on OBB so far, like these Banana Bread Overnight Oats or my Creamy Blueberry Overnight Oats and they’re both amazingly wonderful. I love the Banana Bread recipe in the fall. It’s so cozy and nourishing. I love the Blueberry one in the Spring because it’s right when the bluebs are getting ripe and it’s so deliciously sweet. But for Summer, this is where you will find me all season long. 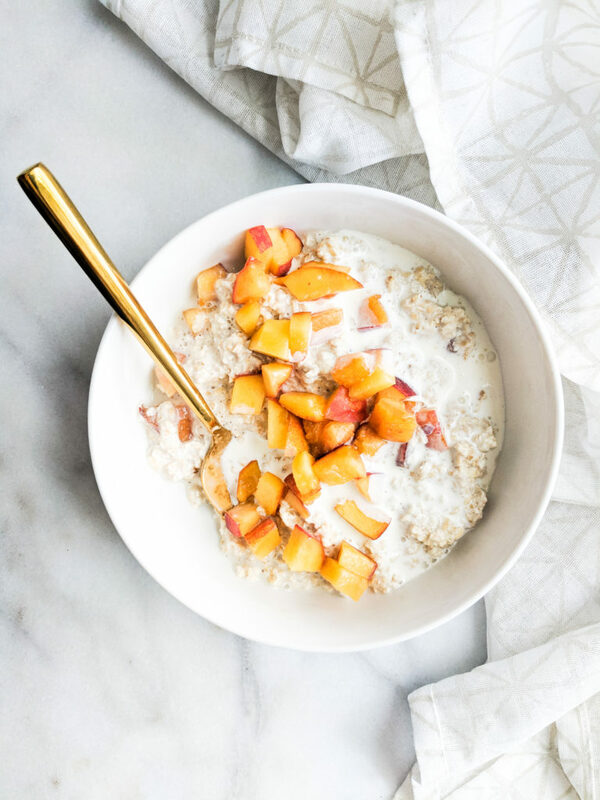 Eating these delightfully sweet, creamy, peaches and cream oats. Y’all remember those little packets you used to get in the variety pack of instant oatmeal right? My favorite was always the Maple and Brown Sugar. However, when you the glorious day came at the grocery store when my mom let me have the fruit + cream variety pack, I was SOOOO pumped to have the peaches and cream flavor! Yes, those packets are probably filled with a million ingredients and have so much sugar. That’s why I wanted to create this new recipe! It has zero, yes, that’s ZERO added sugars. The peaches are absolutely sweet enough to carry this baby. You can feel free to add some extra sugar if you’d like. If needed, honey is a great option to drizzle on top. For some added texture, you could also add a sprinkle of raw sugar. But trust me when I say that the peaches are enough. You just have to let them get deliciously ripe. You know the point of ripeness right? When it’s finally warm weather and you’re sitting outside and you bite into the peach and the juice dribbles all down your chin but you don’t even care because it’s the best, sweetest peach you’ve ever eaten in your life and you’ve never tasted anything better. Yeah, that’s the point of ripeness I’m talking about. The creamiest part of the whole dang recipe? Aside from the oatmeal that soaks up all of the delicious almond milk goodness overnight…the creamiest part of this recipe is THE HEAVY CREAM. Yes, at the end of it all, I added a tablespoon of heavy cream to power up a level. And y’all, I have never have creamier oatmeal in MY LIFE! Please please please do yourself a favor and make this ASAP! Overnight oats + Summer go together like PB+J. Hope you enjoy! Xo. 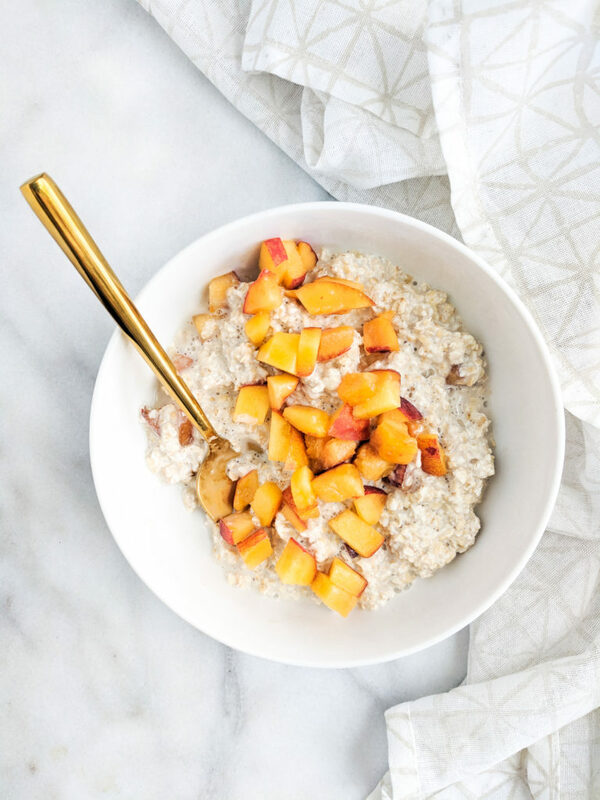 Add oats to a mason jar followed by the diced peaches. Top with almond milk and stir together. Let sit overnight. The next day, top with heavy cream. Stir together and enjoy! 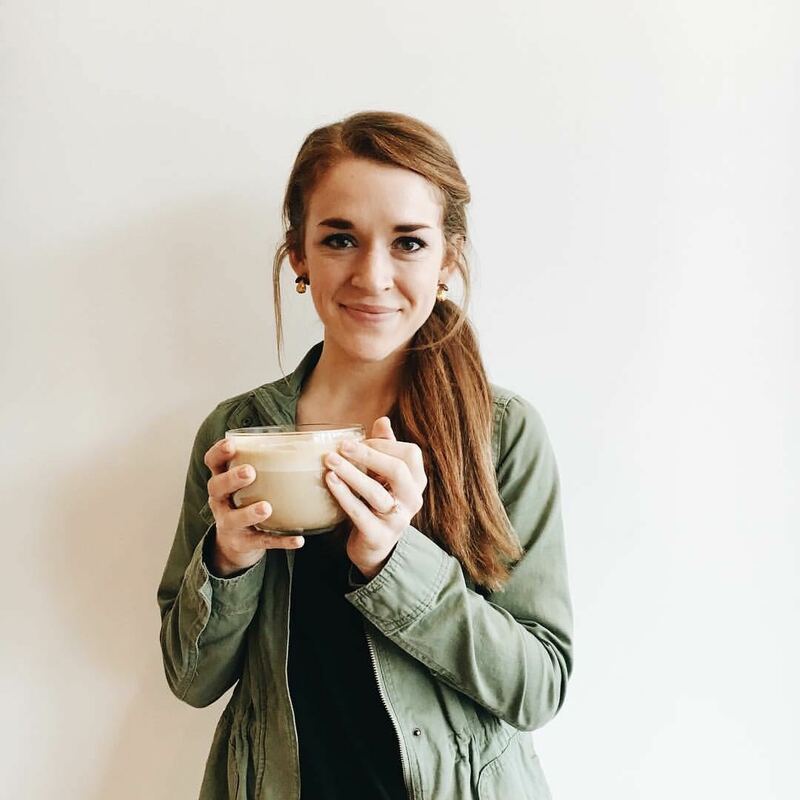 You can use your choice of milk, just note the nutritional information is from using Silk Unsweetened Vanilla Almond Milk. Want the recipe a little sweeter? Add a drizzle of honey or a sprinkle of raw sugar. Vegan? Add an additional splash of almond milk instead of heavy cream. This looks so creamy and delicious! It’s not quite peach season yet where I live but I can’t wait for it! I’m curious. How would you suggest heating this up if you don’t have a microwave? I’m not a fan of eating my oats cold, mostly cause I live in Canada and cold oats just don’t work well when over half your year is frozen and cold.